A new study of gamma-ray light from the center of our galaxy makes the strongest case to date that some of this emission may arise from dark matter, an unknown substance making up most of the material universe. Using publicly available data from NASA’s Fermi Gamma-ray Space Telescope, independent scientists at the Fermi National Accelerator Laboratory, the Harvard-Smithsonian Center for Astrophysics, the Massachusetts Institute of Technology and the University of Chicago have developed new maps showing that the galactic center produces more high-energy gamma rays than can be explained by known sources and that this excess emission is consistent with some forms of dark matter. The galactic center (shown above) teems with gamma-ray sources, from interacting binary systems and isolated pulsars to supernova remnants and particles colliding with interstellar gas. It’s also where astronomers expect to find the galaxy’s highest density of dark matter, which only affects normal matter and radiation through its gravity. Large amounts of dark matter attract normal matter, forming a foundation upon which visible structures, like galaxies, are built. No one knows the true nature of dark matter, but WIMPs, or Weakly Interacting Massive Particles, represent a leading class of candidates. Theorists have envisioned a wide range of WIMP types, some of which may either mutually annihilate or produce an intermediate, quickly decaying particle when they collide. Both of these pathways end with the production of gamma rays—the most energetic form of light—at energies within the detection range of Fermi’s Large Area Telescope, or LAT. 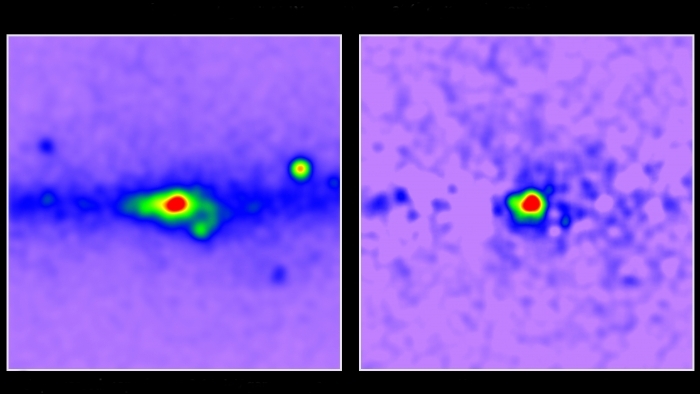 When astronomers carefully subtract all known gamma-ray sources from LAT observations of the galactic center, a patch of leftover emission remains (shown above, on right). This excess appears most prominent at energies between 1 and 3 billion electron volts—roughly a billion times greater than that of visible light—and extends outward at least 5000 light-years from the galactic center. The researchers caution that it will take multiple sightings—in other astronomical objects, the LHC or in some of the direct-detection experiments now being conducted around the world—to validate their dark matter interpretation. “Our case is very much a process-of-elimination argument. We made a list, scratched off things that didn’t work, and ended up with dark matter,” says co-author Douglas Finkbeiner, a professor of astronomy and physics at the CfA, also in Cambridge. For the past four years, the LAT team has been searching dwarf galaxies for hints of dark matter. The published results of these studies have set stringent limits on the mass ranges and interaction rates for many proposed WIMPs, even eliminating some models. In the study’s most recent results, published in Physical Review D on February 11, the Fermi team took note of a small but provocative gamma-ray excess.